Let’s skip the analogies about herding cats and spinning plates: project management is a difficult job that requires an almost obsessive focus. Part of the challenge is in knowing who is available to do the work, juggling their time and the deadlines for specific tasks, and then adjusting for unforeseen circumstances. 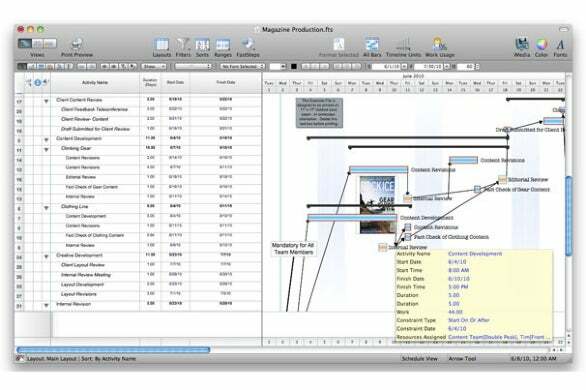 AEC Software’s FastTrack Schedule 10 is a major release for Mac users that will help you stay true to a project plan. A newly designed interface, powerful enterprise-level features, and handy extras make it an outstanding project management aid. Thankfully, one of the main improvements has to do with the re-designed interface. Previous versions looked like Windows ports, but FastTrack now sports the familiar Mac look and feel with easy-to-identify icons for layouts, filters, sorting, and more— all with a text label that matches what you see in iPhoto, et al. The basic Gantt-chart layout (resources on the left, time schedules on the right) also helps reduce complexity. MindJet MindManager 8 is perhaps a bit more colorful, but the FastTrack interface is still very easy to use for most projects. Clearly, FastTrack is moving steadily toward an enterprise-level tool. I’m a former project manager, and I recall using powerful Windows-based project management software that adjusted tasks on-the-fly to meet schedules. These tools, such as CA Clarity, are designed for a large team of project managers who can make team-level adjustments that automatically update group projects. FastTrack is designed primarily for one manager working on one large, complex project and does not directly compete with Clarity or with Microsoft’s enteprise-class project management software. Yet, new features for creating baselines (basically, a snap shot of your project as it stands now), effort-driven schedules (for adding people to a project to make sure it finishes on time), and fix-duration options (for setting unmovable due dates regardless of who is working on the project) hedge the software closer to the enterprise class—and close enough for some. Another advanced feature has to do with contouring. In my management days, this was a major pain—you had to tweak the percentage involvement for team members constantly to make sure you could actually complete the project, yet you also have to make sure people are not over (or under-allocated) on projects. The contouring feature means you can use quick templates (such as “turtle” or “bell”) that fill in the percentage involvement. So, you might decide, for example, that you really need to have a focused effort right when the project starts and right when it ends, and you can quickly schedule your team accordingly. These options are easy to find and easy to use. With its roots as a one manager, one project tool, FastTrack still has some consumer-oriented features that would likely not work in a larger company. For example, you can now add a thumbnail image (such as Sue in accounting or the latest version of the company brochure) to a project task. These images adjust automatically as you change the layout, tasks, and timelines. The images are optional, but enterprise projects usually stay away from this kind of thing. The resource information screens, for tracking the people on a team, their department, and their contact info, also seem geared for smaller companies, since they now include fields such as instant messaging address (IM is not allowed in many large companies for security reasons) and home phone. Does it work for projects? Really, the only way to find out FastTrack Schedule 10 works well as a project management tool is to put it through some paces. I decided to schedule my writing projects using the tool, including assigned tasks to copyeditors (who I actually have no control over) and a research assistant. For fun, I also added my editors who became pawns in my grand scheme for editing finished copy. The report: FastTrack offers such a wealth of options that it is almost impossible to lose track of what is happening. Need to see if a team member is free? You can add color-coding and find out if Bob in marketing is sloughing off or really is busy building a Web site. The new resource graphing features give you a quick view into whether your project is fully staffed and on schedule or falling apart at the seams. One feature I founded incredibly helpful: FastTrack comes with a bounty of templates, such as one for actually producing an entire magazine. You can start with these templates and fill in your own real data, but they are real time savers. I can’t think of any truly negative features in FastTrack Schedule 10. It runs fast and nimble, has plenty of powerful features, and has an amazing cadre of templates. The only real downside: it is not an enterprise tool, so multiple project managers cannot access a project at the same time and make changes. And, as a desktop app, it is only available on your Mac and not from the Web, like many competing tools.